In the last 50 years the wild tiger population has dropped from 45,000 individuals to just 3,800 today. If the current trend continues, tigers could extinct in the wild by the year 2022. Less than 100 years ago 9 subspecies of tigers roamed the far east, including Russia, China, Indonesia, India, Korea, and all the land in between. Poaching and habitat loss, however, wiped out the Caspian, Javan, and Bali subspecies who were all once found in Indonesia. The South China Tiger is considered functionally extinct. Though a few remain in zoos, one has not been spotted in the wild in the last 25 years. Tigers have always been admired and feared by humans, which has led to their decline. As the human population increases, so does the demand for tigers natural habitat, its resources, and unfortunately also its parts. In some cultures, the entirety of a tiger’s body can be sold off, making the seller over $60,000. With the loss of the tiger though, comes the loss of thousands of other species of flora and fauna living in the same areas. Unfortunately the fate of tigers in the United States is not much better. There are an estimated 10,000 tigers in the United States and only 6-7% of them are in accredited facilities. The rest are in the hands of private owners, roadside zoos, or the entertainment industry. It is estimated that there are more tigers in the state of Texas than than in the wild. In the last 100 years wild tigers have lost over 93% of their habitat range. Tigers are considered Umbrella Species, if we can save the tiger, all the plants and animals that live in its habitat will also be saved. Tigers are the largest of all the cat species. They can weigh up to 700 pounds. One of the main threats to tigers besides poaching is habitat loss. More than 300 football fields of tiger habitat is cleared every hour to make room for palm oil plantations. In the wild, the average lifespan of tigers is 8-10 years. In captivity they can live upwards of 20 years. Tiger cubs in the wild will stay with their mothers for the first two years of their lives then will go off and find their own territory. It is important to know that without drastic change, the fate of wild tigers is grim. It is predicted that if nothing changes, wild tigers may be extinct in just 4 or 5 years. 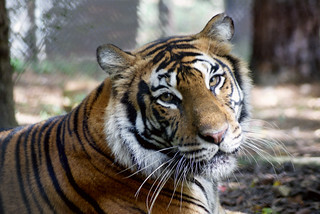 You can help protect wild tigers by limiting your consumption of palm oil. Palm oil is in over 50% of consumable goods. if the demand of palm oil decreases, so will the number of palm oil plantations. You can help captive tigers by avoiding cub petting. Tigers used in cub petting are generic tigers, that are not one specific subspecies, therefore they are not aiding in conservation. Places that allow you to hold, pet, or take pictures with tigers are using them for exploitation, and once those cubs are too big to be handled, they are often euthanized, sold into roadside zoos, the pet trade, or the parts trade.